A great poem in world Literature, Dakshinamurti Stotra reveals the Poet and the Mystic in Sri Sankaracharya in unison at the highest altitude of his being. The four sons of Brahma born of his mind - MANASA PUTRAS- declined to continue the line of creation. Intent on returning to the source they found themselves in the Presence of Siva as Jnana-Dakshinamurti in a blissful inner state of "Knowledge by identity". The thin veil over their eyes dropped as they, along with other sages, gazed at the luminous Silence. The perfect teaching was given and received in Silence. Sri Sankaracharya realized it in his own person and he gave utterance to that Silence of Compassionate Knowledge in these en stanzas of winged words for the benefit of humanity. Sri Suresvaracharya wrote a commentary Manasollasa - Brilliant play of thought - on this hymn of his master to enlighten those who needed further help. Added to these text are the ancient Dakshinamurti Upanishad and Suresvaracharya's Pranava Vartika in Nagari Script. The translation of these four texts into English is by Sri Alladi Mahadeva Sastri the well-known scholar whose masterly introductory essay: The Vedanta Doctrine of Sankaracharya will help the reader immensely. Adi Sankara's is the earliest extant commentary on the Bhagavad gita. The text of the Gita as cited by him has come down the centuries as the authentic text and this commentary of his has proved to be of seminal value ever since. Later commentators may differ from him on textual and even metaphysical interpretation but the spiritual well-being flowing into us on reading the Gita-Bhashya of Sankaracharya is universally acknowledged. One has only to read it to feel it. This book contains the original Sanskrit text of the gita in Devanagari followed by its translation as also the translation of Sankara's Gita Bhashya in English by Alladi Mahadeva Sastri. The Translation has stood the test of time since its first publication in 1897, being the best available English translation of Sankaracharya's commentary. The learned translator has added in the form of foot-notes (marked A) explanations mostly extracted from Anandagiri's Tika, which is always the clearest and most to the point and is almost indispensable for a proper understanding of some important portions of the Bhashya. i. S'ri S'ankaracharya 's Dak shinamurti-Stotra, an ode to the Divine Self, with Sri Suresvaracharya's expo- sition named Manasollasa' "Brilliant play of thought." ii. S'ri Suresvaracharya's Pranava- Vartika treating of the contemplation of the Supreme Arman by means of the Pranava. S'ankaracharya's immortal Hymn and the two works of Suresvaracharya. herein comprised epitomise the whole Vedanta Doctrine as expounded by the two authors in their commentaries on the Upanishads, and form a good introduction to a study of the subject. As a terse expression of the fundamental truths of the Vedanta, the well-known Hymn of S'ankaracharya forms a suitable text upon which the student may meditate and thereby construct the whole doctrine for himself. The reader will also be struck with the catho- licity of the teaching, which is not addressed to any particular class of people nor contains any reference to distinctions of caste and religious order, while concisely stating the process by which the oneness of Self and the unreality of all else is established. Manasollasa is more original and telling than any of the later manuals which state the doctrine as derived from the expositions of the two eminent leaders of the Advaita Vedanta school of thought. Very little need be said regarding the high position which S'ankaracharya holds among the teachers of the Vedic Religion. Of Suresvaracharya, however, his immediate disciple and literary collaborator, ordinary students of Vedanta know less than they ought to, simply because his writings have long remained in- accessible to all but the very select few who entered the fourth order of sannyasa and were intellectually qualified to study the highly erudite exposition of philosophy and metaphysics. Suffice it to say that, according to all received accounts, the great aim of S'ankaracharya's missionary peregrinations was to secure the eminent mimamsaka's allegiance to his own system of Vedanta. The nature of the work to which this disciple is said to have been detailed by the Teacher, and the masterly fashion in which he has done it, - the work, namely, of elucidating, systematis- ing, supplementing and even improving upon the great Master's teachings,-more than justifies the honourable position which tradition has unanimously accorded to him. He is known as the Vartika-kara, author of elucidative commentary on the teachings of S'ankara- charya who is known as the Bhashyakara, author of original commentaries. 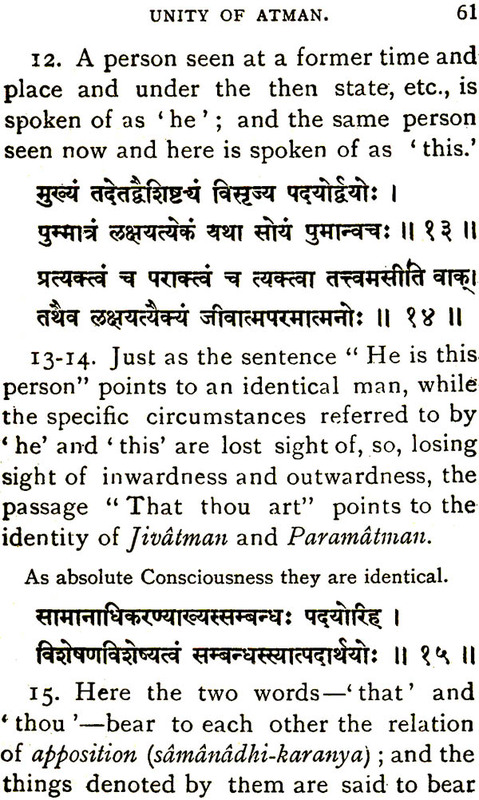 "Vartika" is defined as follows: Uktanuktaduruktarthavyaktakari tu vartikam..
(3) Naishkarmya-siddhi, a manual of Advaita doctrine (Bombay Sanskrit Series). (4) An exposition of Sankaracharya's commentary on the Taittiriya-Upanishad (Poona, A 'nandasrama Series). (5) An exposition of Sankaracharya's commentry on the Brihadaranyaka-Upanishad (Poona, A'nandas- rama Series). Suresvaracharya's exposition of the Vedanta Doctrine is often very original and is throughout marked with such thoroughness, precision, and clearness that it forms a very valuable supplement to the teachings of the Upanishads; and its authority on all knotty points is acknowledged with due reverence and submission by all the Advaitic writers of later days. As an effective aid to a right understanding of the truths taught in the Vedanta, Sankaracharya's Hymn as well as Sruti inculcates highest devotion to the Divine Being as the Guru of Gurus, and an equal devotion to one's own immediate Guru who should be regarded as an incarnation of that Guru of Gurus. 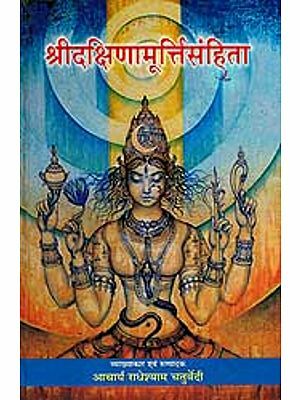 The Dak- shinamurti-Upanishad shows in what form Siva, the Guru of Gurus, should be imaged and devoutly wor- shipped in the heart by the neophyte who is about to engage in a contemplation of the truths taught in the hymn. The style of the Upanishad is in perfect keeping with the character of the Minor Upanishads described in my introduction to "the Minor Upanishads, Vol. I." As Sures'varacharya's Manasollasa refers to various philosophical systems of his day, I have thought it necessary to add an introduction to it treating briefly of the origin, methods, and fundamental tenets of the several systems referred to, so that the reader may have a comprehensive view of the whole range of Indian philosophy, at whose summit, towering high above all, stands Vedanta, the pinnacle of Aryan thought. In this edition the Sanskrit texts of Manasollasa and Pranava-vartika have been added, while in the first edition the texts of Dakshinamurti-stotra and Dakshinamurti-Upanishad were alone given in the form of an appendix, separately from their translations. All the four texts are here embodied along with their English translations, for convenient reference. The text of the Manasollasa followed in the first Edition has been revised with the aid of the Mss. of the Adyar Library; and this has rendered necessary some changes in the text and the translation here and there. In other respects the second edition remains the same as the first. This great book was issued earlier by the well-known publishing House of VAVILLA under the title: Minor Upanishads Vol. II. Dakshinamurti Stotra is one of the great poems of the world, revealing Sri Sankaracharya the Poet and the Philosopher-a rare combination-at the highest altitude of his being. We deem it a privilege to issue this inspiring work as our second publication. "Whoso hath highest love for God, and for the Guru as for God, to that Mahatman, the truths here taught shine in full." (Svetasvatara-Upani- shad, VI, 23). These are the words with which the Upanishad concludes its teaching and with which Suresvaracharya, like many other teachers, doses his exposition of the Vedanta Doctrine. They form the key-note of the whole Vedic Reli- gion as of all other Religious systems based on Revelation. It behoves, therefore, the student of spiritual wisdom,-nay, it behoves every seeker after Truth,-to study and understand the principle enunciated in the passage quoted above. To this end we have first to determine what place Rev- lation occupies in a religious system and how it helps man to realise truth. The Veda which is composed of different parts embodying teachings suited to different classes of people is, even in the form in which we have it, one of the oldest, If not the oldest, Scriptures accepted by large masses of people, revealing truths derived from the most trustworthy source, from God Himself. It may, therefore, be taken as the type of Revelation intend- ed to help the growth of man towards the attain- ment of his highest end. 2. What is the highest end of man? As to the ultimate end of man, a consensus of opinion can be obtained by a direct appeal to consciousness, though there may be found divergencies among writers on ethical philosophy as to the immediate end which man should place before himself in his conduct towards himself or in his conduct towards others. All are agreed that the one aim which man has in all his acts is to secure happiness for himself. The highest as well as the ultimate end of man must, therefore, be to attain to a conscious state of unalloyed happiness, which is to be eternal and unsurpassed, To have a clearer and more defi- nite idea of the highest end of man, it is necessary to compare him with other creatures in the universe and to mark the stage he has already reached in the march of progress towards the attainment of his highest end. The ancient Aryans have traced the evolutionary process in detail, and they fall in• with the modern science as to the view that human form has been gradually evolved out of the animal. The evolutionary process which went on through the three lower kingdoms of nature below man,- not to speak of the still earlier stages of evolution referred to in the Upanishads, in the Puranas, and in the orthodox systems of philosophy,-was con- cerned mainly with the perfecting of form, of the material vehicle used by Spirit, the Divine Consci- ousness, in Its evolution towards perfect self -reali- sation. The main purpose of this evolution is to so perfect the form as to make it a proper medium for the Divine Being dwelling within every crea- ture to fully express Himself in all His aspects as Consciousness, Will, and Bliss. In the mineral kingdom, the physical form, which in the earlier kingdoms was more or less unstable, has attained to the highest degree of development in point of persistency under varying conditions; and in the vegetable kingdom, it becomes pliable to the action of vital force in the form of organic growth, with- out at the same time losing the persistency it has already gained in the mineral kingdom. The evolu- tion of form in the animal kingdom adds to its persistency and improved capacity for organic growth a well-defined capacity for a life of sensa- tion, all organs of sensation and activity being developed to a marked degree. In man, form is still further developed so as to constitute a fitting- instrument for the carrying on of the process of thinking. By the time that the evolution of human form has, after passing through a long transition period, reached that stage at which it no longer admits of any appreciable further development, what we call mind begins to show signs of its existence by way of perceiving objects, connecting them together, comparing and contrasting them with one another,-processes which constitute the germs of the thinking faculty. To explain: Ani- mals, in common with man, possess a life of sensa- tion, their sense-organs equally receiving• and responding to impacts from external objects; but they evidently seem to lack the power of connect- ing the various impressions together into a single composite whole; i.e., they seem to have no facul- ty of perception. They receive impressions through the sense-organs from without; and these impres- sions affect in their turn the prana or vital princi- ple wherein they abide. In response to the impresssions received through the sense-organs, prana gushes out through one or more organs of activity in the body; and, as a result, the sense- organs are brought in contact with more objects. In the animal, the sensory and motor forms of vital energy thus act and react upon each other, each contributing to the growth of the other. But this reciprocal action and reaction of the sensory and the motor organs on the growth of each other as a result of receiving impacts from the external world can in no way correspond to the purely internal faculty of perception and conception con- stituting the germs of that faculty of thinking which forms a distinguishing feature of human beings. Thus, man is distinguished from lower animals by the possession of this faculty of per- ception and thought. It is in him that we find Atman,-the one Existence and Consciousness present in all kingdoms of nature alike,-manifest- ing Himself in every act of consciousness as “I, " as the Individual Ego, persisting through various sensations, each of which comes into being for a moment and then disappears. It is this self-con- scious Individual Ego who, abiding one and the same through all the various sensations, receives them all and connects them together, converting them, into notions of substances and attributes, comparing and contrasting them with one another. taking note of their mutual relations, deducing- laws, and carrying on the elaborate process of reasoning. Pari passu with this development of -thinking faculty goes on the development of will, freedom of will progressing with thought and knowledge. 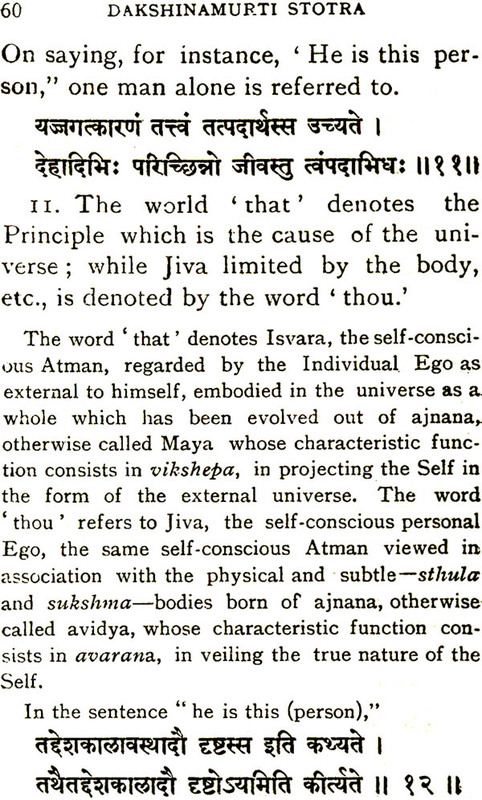 It is, therefore, evident that the ulti- mate end of every human being should be to develop thought and will, by proper exercise through his form, to the highest stage of perfec- tion; to attain to a full knowledge of the whole universe; to develop the self-consciousness and .will of the Ego till he realises his unity with the Universal Ego, with the Divine Being possessed of all-embracing knowledge and love as well as an absolutely free will unswayed by passion, all bending• before His adamantine will, the whole universe subservient to Him as a pliable instrument in His hands ;-seeing himself everywhere and none else anywhere, endued with Bliss infinite and unalloyed, transcending all limitations of time and space. Such, briefly, is the end which man has to attain, and which, of course, is worth attaining ..
3. Now, if we compare man just emerging from a state of nature and in whom manas just begins to function, with a man who belongs to one of the most civilized races now inhabiting the globe, the difference in mental development will be found strikingly great, so great indeed that, but for the similarity in the structure of the body, they may belong to two different species altogether. The rate of progress in this line of evolution seems to be very slow. The various faculties which go to form the main stock of innate capacities of a civilized man have been developed slowly one after another in successive races, It takes, indeed, a very very long time for a faculty to develop from its germinal stage even to that stage of perfection which it has reached in man at present. In fact we are told that this mental development has gone on concurrently with the racial development for ages and ages. Though each race has a develop- ment of its own as a whole, yet any given race is made up of individuals whose progress varies very widely between two extreme points. Considering the little progress made by an individual Ego in a savage or a half- savage tribe by way of acquiring a new faculty or even a further development, to . any appreciable extent, of an already existing faculty,-as distinguished from the matter com- prehended by that faculty,-one finds it hard to believe that all the faculties that an Ego, taking birth in a family of the most civilised race, mani- fests on attaining to a certain age have been deve- loped in a few past incarnations just preceding the present, and much less so in the present birth alone. Moreover, the different stages of progress in mental and moral development reached by different individuals, as well as the different rates of progress made by different individuals placed under the same circumstances, point, beyond all reasonable doubt, to the fact of each individual Ego having an evolution of his own which has been going on through many Ii yes in the past, bringing with him into each birth faculties already developed to a certain stage and ready to pace a few more steps forward in that incarnation. It may even be noted that, in the early years of any particular birth, the individual man rapidly goes through the whole process of past human evolu- tion till that point of progress is reached whence he has to continue the slow process of further development. First Stanza of the Hymn-The purpose of the Hymn-The fundamental questions-the Universe exists in the self-The Universe shines by the light of the Self-Realisation of Non-duality-A'tman as I'svara and Jiva-I'svara is the Self in all-I'svara's consciousness is one and self-luminous-I'svara's activity-I'svara and Jiva differentiated due to Maya. Second Stanza of the Hymn-Vaiseshika's Atomic theory-Vaiseshika's threefold cause-The Sankhya Theory-Refutation of the Atomic Theory-The Theory of Illusion-Intelligence and activity inhere only in the Sentient-The Vaiseshika's categories-The Sankhya's categories-The twenty-four Principals of the Theistic Sankhya-The twenty-four Principles of the Atheistic Sankhya-The Thirty Principales of the Pauranikas-The Thirty-six Principles of S'aivagama-Vedic Doctrine of Maya-I'svara is not a mere efficient cause. Third Stanza of the Hymn-Absolute unity of A'tman-Avidya, the cause of delusion-the body separates Jiva from I'svara-Their unity taught in the S'Ruti "That thou art"-The S'ruti points to no sort of distinction between Jiva and I'svara-A'tman identified with the body, etc, by ignorance-A'tman's manifestation in the five Kosas-Jiva and I'svara one in essence-Realisation of A'tman's unity leads to Liberation. Fifth Stanza of the Hymn-A'tman identified with the physical body-A'tman identified with Prana-A'tman identified with sense-organs-The body, etc., cannot be A'tman-Why the body is not A'tman-Why the sense-organs cannot be A'tman-Why Prana is not A'tman-Why Buddhi is not A'tman-Why the aggregate of the body, etc. is not A'tman-A'tman is all-pervading-The Illusion. Sixth Stanza of the Hymn-Buddhistic Nihilism (Sunyavada)- Refutation of Nihilism-refutation of the doctrine of the five Skandhas-Pratyabhijna is no illusion-A'tman's continuous existence, A'tman's true nature. Seventh Stanza of the Hymn-Authority of Pratyabhijna questioned-Pratyabhijnana explained as a proof of A'tman's eternality-Adhyasa or Illusion. Ninth Stanza of the Hymn-Maya ceases by Devotion-Devotion to Isvara in His visible forms-Unity of Macrocosm and Microcosm-Devotion to I'svara in the Microcosm leads to unity with the Macrocosm-Correspondences between Macrocosm and Microcosm, as to Earth, Eater, Fire or Light, Air, A'kasa, the Sun, the Moon and the Soul-Samanaska-Yoga leads to the Amanaska-The eight steps of Yoga: (1) Yama, (2) Niyama, (3) A'sana, (4) Pranayama, (5) Pratyahara, (6) Dharana, (7) Dhyana, (8) Samadhi-Yoga, necessary for steadiness of Manas and Prana-Lambika-Yoga for steadiness of Manas and Prana-Lambika-Yoga-Signs of perfection in Yoga-I'svara's manifestation in Yoga-Manifestation of Pranava in Yoga-The Grace of God and Guru necessary. Tenth Stanza of the Hymn-The Highest end-The Eight Siddhis-glory of the Divine Contemplation-Love of god and Guru necessary for Wisdom. Purpose of the tract-The Avyakrita-the Sutra or Hiranyagarbha. The three aspects of manifested Brahman-Visva and his unity with the Viraj-Taijasa and his unity with the Hiranyagarbha-Prajna and his unity with I'svara-The One Reality-contemplation of A'tman by Pranava-Jivan-mukti-Conclusion.